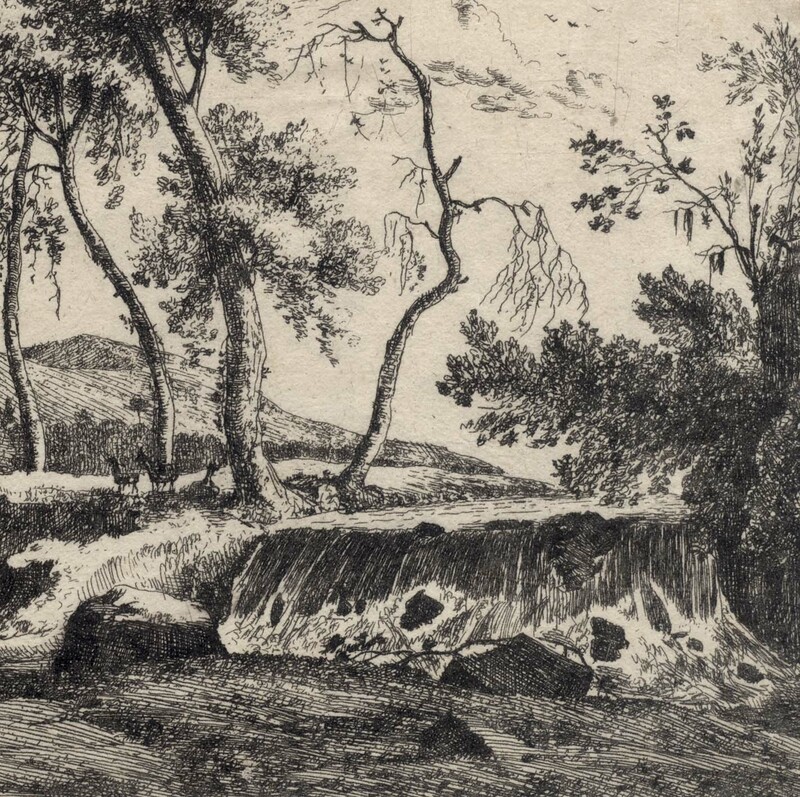 “The Waterfall”, 1650–83, plate 6 in the series of eight plates, “Views of Italy” (TIB) (aka “Tyrolean landscapes” [Rijksmuseum]), published in Augsburg in the edition by Melchior Küsel (1626-83) or more likely in the later edition by Jeremias Wolff (1663–1724) as the plate number (“6”) has been almost erased in the margin. Etching on fine laid paper trimmed along the platemark with a trace of a collector’s stamp at the upper-right corner (recto). Inscribed (but almost erased in this impression) below the image borderline to the right of centre: “6”. Condition: well-inked impression in excellent condition (i.e. there are no holes, tears, folds, stains or foxing). 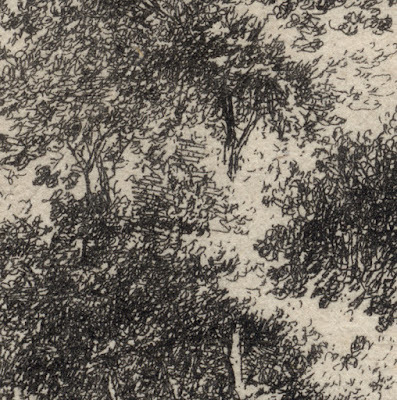 There is a faint circular line at the upper right-corner—presumably the trace of a collector’s stamp. 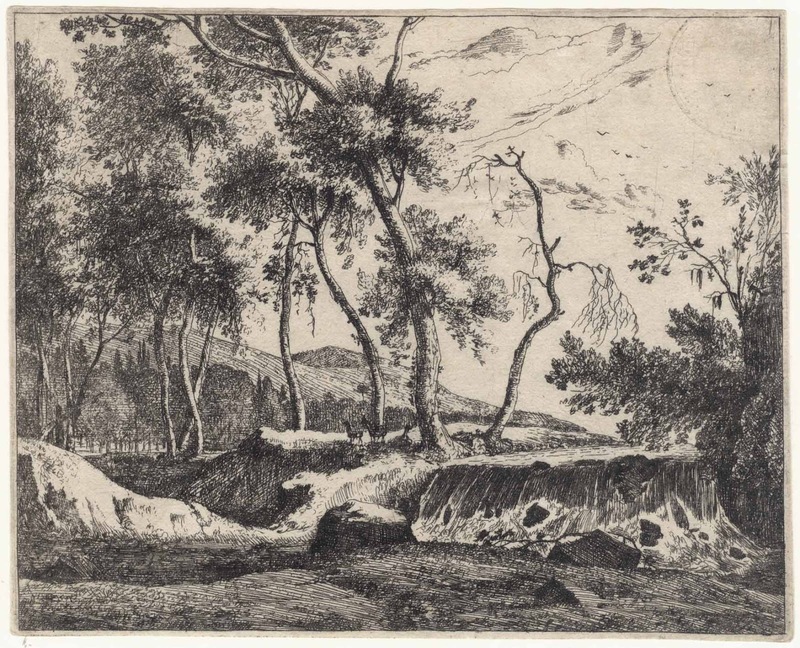 I am selling this superb impression of an extremely rare print from the time of Rembrandt—Roghman was even one of Rembrandt’s good friends—for the total cost of AU$310 (currently US$234.11/EUR209.13/GBP184.64 at the time of posting this listing) including postage and handling to anywhere in the world. If you are interested in purchasing this beautiful etching that is so rare that it is virtually never seen on the market, please contact me (oz_jim@printsandprinciples.com) and I will send you a PayPal invoice to make the payment easy. 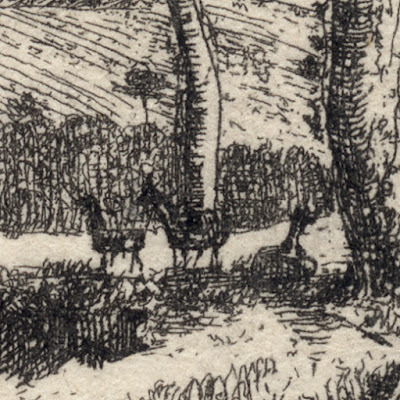 This tiny detail showcases Roghman’s mastery of drawing. 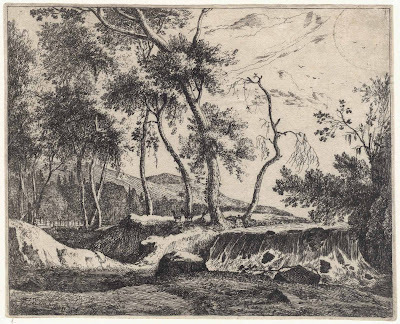 Note how he uses tiny horizontal strokes to give the suggestion weight and dark tone to the base of a foliage mass and even smaller strokes—dots really—to connote intense light hitting on the upper regions of foliage. Even more subtle is Roghman’s use of noetic space (i.e. 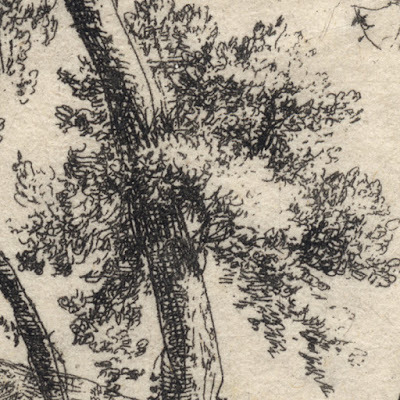 non-drawn areas where the mind’s eye “sees” what is represented even though there are no marks representing what is physically to be seen) on the shadow side of the tree limb where he has chosen not to merge the foliage with the tree limb even though the foliage clearly “touches” the limb. 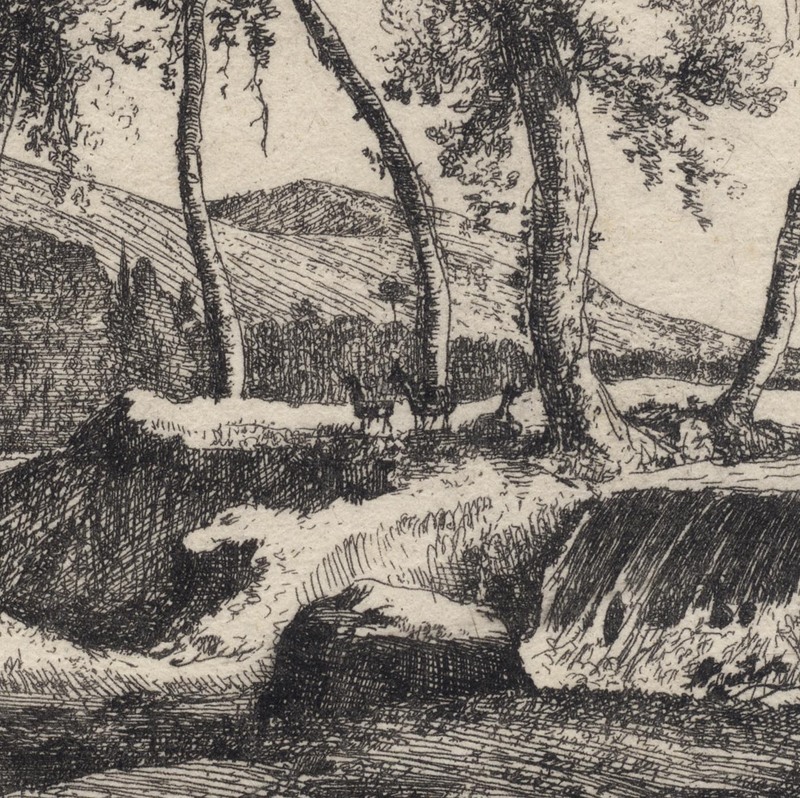 I love the way that Roghman uses light to dissolve tree limbs and uses hatching strokes to give the suggestion of where the mass of foliage is and its tone without actually drawing details of leaves.